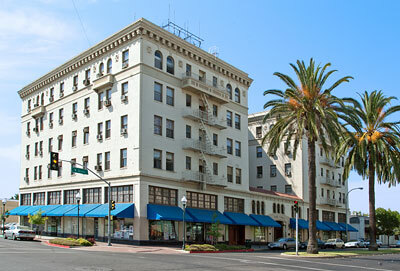 The Tioga Hotel was one of the grandest hotels of the agriculturally rich San Joaquin Valley. With its marbled and hand crafted tiled floors, magnificent art deco ceilings, ballroom, and facilities, the Tioga played a vital role in the community due to its strategic location at the connecting routes of the Southern Pacific Railroad, which traveled north and south from San Francisco, and the Yosemite Valley Railroad, which traveled east and west to Yosemite National Park. When Merced was originally laid out by the railroad its planners used the standard grid iron pattern of streets. These streets were normally established on a true north-south axis, but in Merced the streets are slightly off the compass axis but in perfect alignment with the railroad tracks. The town's main axis was a wide street divided with landscape which led from the railroad's depot to the county courthouse. The second axis of the town plan was the prime commercial street. This intersection was the pivot point for the prime streets of the plan. The Tioga occupies the northwest corner of this intersection only one block from the railroad depot. Today the former hotel is doing business as Tioga Apartment Homes.